Preparing for a stair climbing race can be tricky if you don’t have access to a tall building. But even if you don’t live or work in a high-rise tower, there are still options available to get in some great, specific training. Read on to find out some of the best places to run stairs in London. When traveling on the tube, don’t just stand on the escalators. Get moving and pump up the left hand side two steps at a time. If you’re a regular commuter, you will certainly get some benefits from these short bursts. For something more substantial, you’ll want to head onto the emergency stairs at one of the stations. 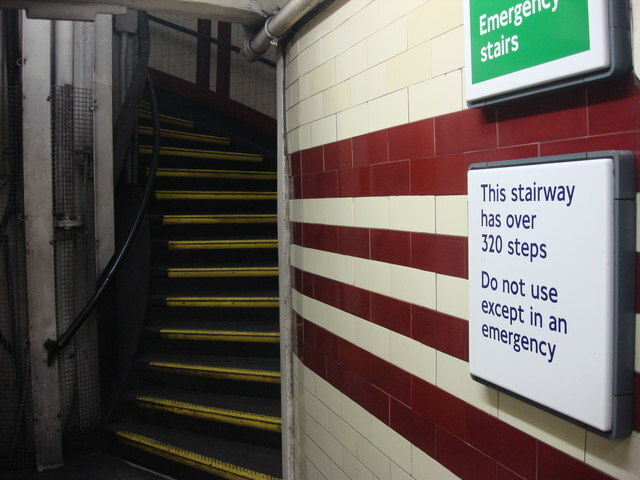 The popular suggestion when this comes up is to head for Covent Garden, where there are 193 steps. People often wrongly assume this is the tallest set of stairs on the Underground. It isn’t. That honour goes to Hampstead Station on the Northern Line, which boasts over 320 stairs. Covent Garden is one of the busier stations on the network and in our opinion it’s to be avoided. Its central location is appealing, but it’s just too busy, and really the ride out to Hampstead is worth it. There you will almost certainly have the stairs to yourself for the duration of your session, and the lift is close to the top of the steps making fairly quick intervals possible. The staff there are pretty friendly too and might let you leave a bag in their office while you train. Do not leave anything at all on the stairs while you are running, as you will almost certainly be asked to move it. Pack light and run with your stuff in a back pack if you can’t, or don’t want to, leave it with the staff upstairs. Also, be sure to bring some water, and maybe some latex gloves because the bannisters are very, very sooty and will leave your palms completely black. The only down side to training on the underground is that it can be quite difficult to get a good rhythm going on the spiral staircase. Plus there are no landing turns so you won’t be able to practice those either. London is home to the tallest hospital in the world, which is Guy’s – with its Tower Wing being the tallest building in it. There are 700+ stairs there to train on, and access in and out is pretty straightforward. It’s located a very short walk from London Bridge Station, just behind The Shard, and is the best option in the city for stair running. Check out its location here. We’re not going to name the hotels you can train at in London because we don’t want them being overrun and security being tightened so much nobody can access them. There are hotels across the city you can walk into and get a few lengthy runs in without attracting much attention. You will have to ‘shop’ around a bit as some will have higher security than others, but training on hotel stairwells is a viable option. These are a real treasure. We have 170 steps at our office (7 floors) and with the lift right next to them it is very easy to get in a lot of stair running before or after work. If you work in a tall office block you are flying, and should make the very most of the opportunity. If like us you work in quite a small block, you will have to be creative with your routines, but it is still definitely possible to get a great workout in with only 5 or 6 floors. If you live in a tall block of flats you are good to go. If not then ask about on Facebook to see if any of your friends will let you visit them and get in some long climbs. If neither of those options are a possibility you can sometimes access flats early in the day using the ‘Trades’ entry button. Some flats won’t have this and instead have a security desk. We find that if you are friendly enough and explain that you are training for a charity run, they will sometimes let you in. If you do manage to get access to a high-rise you also have the benefit of taking the lift down, which saves your legs and cuts down on training time. Found some stairs, but not sure what to do now? Read our guide on stair climbing for beginners to find out some training tips and advice. Excellent. Many thanks. Ive spent ages trying to find a place suitable to train on stairs and i just found this website. I was surprised at how difficult it was to find info on steps in London.